While Disney continues to eat its own corpse with crap like Brother Bear and Dumbo 2: Electric Boogaloo, Pixar manages to make wonderful works of art not because they're using computers, but because they're using better storytellers. Their most recent storyteller was Brad Bird, the guy who brought us 1999's spectacular Iron Giant. His newest effort was The Incredibles, a look at superheroes forced into early retirement. 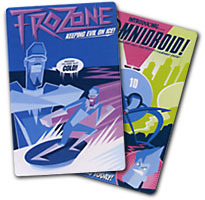 One of the coolest creations (no pun intended) was Lucius Best, a.k.a the thermo-powered hero Frozone. While the Incredibles toys found in Wal*Mart or Toys R Us are definitely aimed at children, there is an entirely different line available only at the Disney Store and featuring more collector-friendly figures: a larger scale, more articulation and no action features. Frozone stands 6 3/4" tall and moves at the neck, shoulders, elbows, gloves, wrists, waist, hips, knees and ankles. I don't know if an actual sculptor worked on the figures, or if they were just built from the computer models, but the look is dead-on. Frozone was a skinny guy, and the figure follows suit. It almost looks like he shouldn't be able to stand on those tiny little feet of his, but he's plenty stable. The paint apps are good - Frozone's costume was blue and white, very appropriate for an ice guy - white area suggests jagged icicles hanging down, and the blue is very cool. Instead of being flat white, the light sections are pearlescent, which gives them a frosted look. Very nice stuff. Though they run right into each other, there's no spillage between the white of his suit and the brown of his skin. Even the little purple stripe of his visor is handled well. Frozone's got two accessories, both based on the film: a pair of skis and a sled disc. They each have footpegs so that you can attach them to the figure, and the disc is actually painted three shades of gray, a nice attention to detail. Also included in the package are two Incredibles cards and a child-sized translucent blue I-logo ring. The cards have the same sort of art deco look as the film's closing credits. The Disney Store Incredibles figures are really good, a suitable souvenir of a fantastic film. It's annoying that Disney limited who would ever see these by putting them in such a niche market, but they're worth the effort to hunt down. What's your favorite Samuel L. Jackson role? Tell us on our message board, the Loafing Lounge.